Whole oven-roasted snapper, my fishy pride and joy! After two dinners out this week, I was craving to eat something of which the ingredients were all known to me. Something simple, healthy, and home-made. Sick of cooking the usual grilled salmon, trawling the internet led me to this wonderful recipe, which I tried for the first time, and has now been named by PB as my “best fish dish, ever”. You can try this dish with all kinds of white, firm fish – we went with Red Snapper. He had nice eyes and looked fresh! ♥ Pre-heat the oven to 200°C. 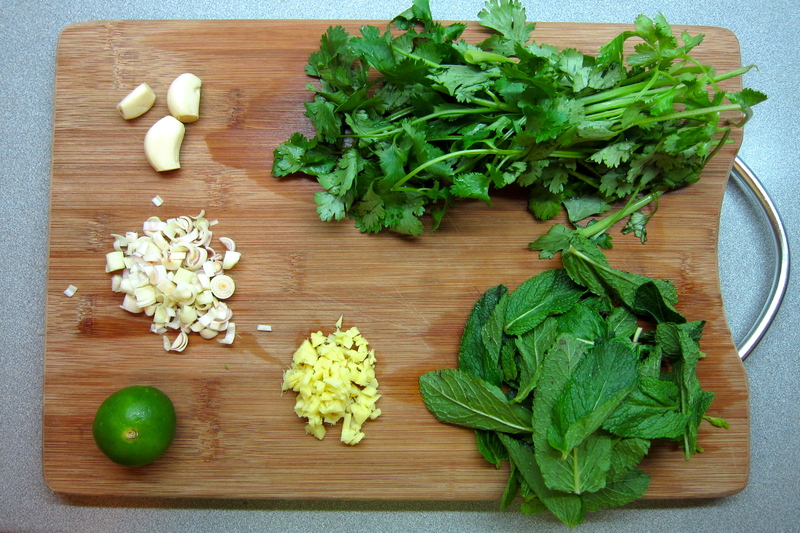 Combine the coriander, mint, garlic, lemongrass, ginger, fish sauce and lime zest in a food processor and pulse until puréed. Optional: slowly drizzle the peanut oil olive oil until the mixture resembles a thick pesto. Note: Although olive oil is usually present in the conventional pesto, it really isn’t needed in this recipe, the herbs themselves flavour the fish incredibly, and the juices from the fish keep it moist and create a little sauce. ♥ Rinse the fish and pat dry. Season all over with salt and pepper. 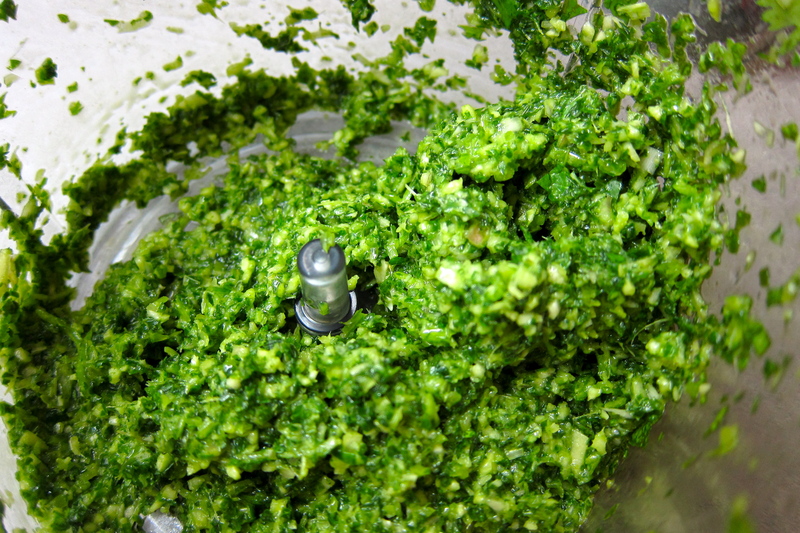 Stuff the fish cavity with the pesto mixture and close with butcher’s twine or toothpicks. 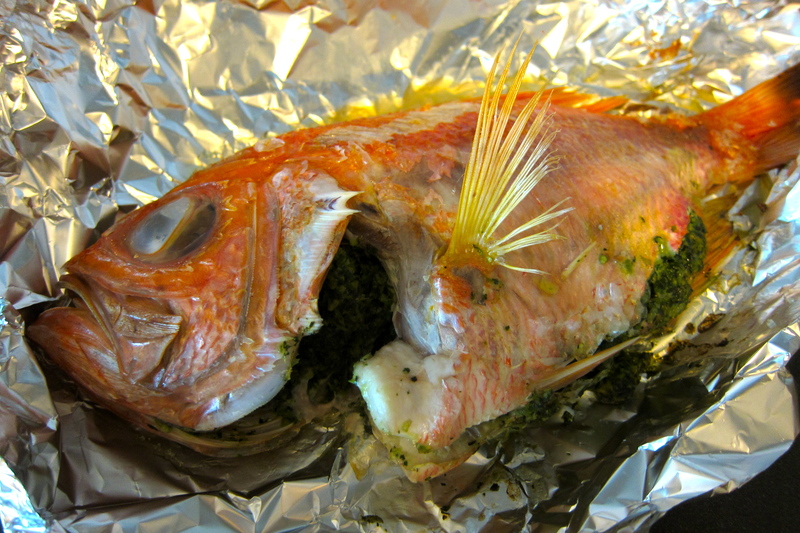 ♥ Cut off a piece of foil large enough to cover the fish, drizzle a little olive oil on the foil so that the fish doesn’t stick, and wrap up the fish, making sure there is enough room in the parcel for the heat to circulate. Place it on a baking tray and roast in the middle of the oven for 40 minutes, until the fish is white and firm. I wanted to have this fish with a huge plate of broccoli, but for some reason both of my local supermarkets were completely sold out tonight! Very peculiar. So instead, I went with green beans, sautéed with a little bit of garlic. 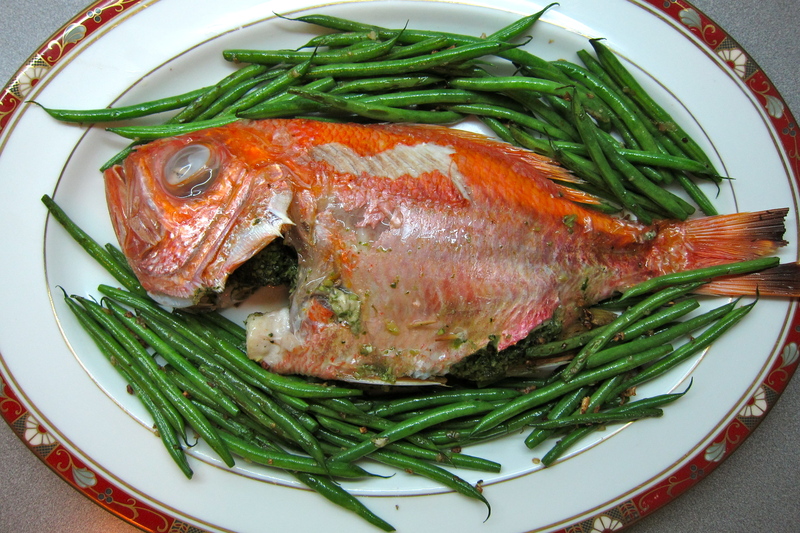 Roasting the fish whole makes for a very pretty plate, but it’s a little impractical to eat, bones and skin and all. I’m sure that this Thai Pesto will work just as well with a nice fillet of fish, and it would also cut down cooking time. I reckon a fillet would only take about 10-12 minutes to cook under the grill, and it would still be enough to infuse that fish with the exotic flavours of lemongrass, coriander, ginger and garlic! I imagine it would also work well with steamed mussels or clams, yum. I’m definitely going to try that one day.